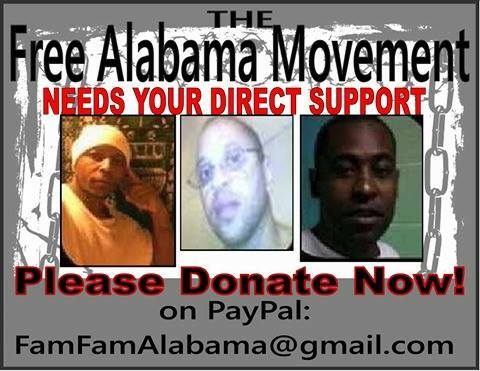 FREE ALABAMA MOVEMENT is a grassroots organization founded by men incarcerated in Alabama that supports the Non-Violent and Peaceful Protests for Civil and Human Rights by the men and women (and children) who are incarcerated in Alabama, Mississippi, and anywhere else in the U.S.A.
FREE ALABAMA MOVEMENT has chosen the Non-Violent and Peaceful Protest strategy of “shutdowns” / work stoppages to combat the multi-billion dollar Prison Industrialized Complex that has incarcerated over 2 million people for the sole purpose of exploitation through free labor, private prisons, exorbitant fees, and more. The D.A.’s, the parole board, legislatures, and so-called victims advocacy groups and business interests have told the public that the reason we can’t earn our freedom is because we are violent. Well, not only will we continue to demonstrate that we are Non-Violent, but we will also continue to demand that we be afforded access to Education, Rehabilitation and Re-Entry Preparedness so that when we are released, we can make a positive contribution to society. Also, we have chosen Non-Violence and Peace because there is nothing violent about telling a State that we do not wish to be forced into decades of free labor and be exploited, abused, raped, and beaten in the name of Corrections. Beginning on January 1, 2014, F.A.M. organized “shutdowns,” or non-violent work stoppages at Holman and St. Clair Correctional Facilities, where over 2,300 men engaged in non-violent and peaceful protests for the Civil and Human Rights. By January 7, 2014, as word spread to other prisons, over 4500 men incarcerated in ADOC had joined this Non-Violent and Peaceful Protest. These demonstrations ended without a single act of violence. These Non-Violent and Peaceful protests sent a strong message of unity and Economic Empowerment amongst the men and women incarcerated. disproportionate Black men/youth incarceration at historic levels. 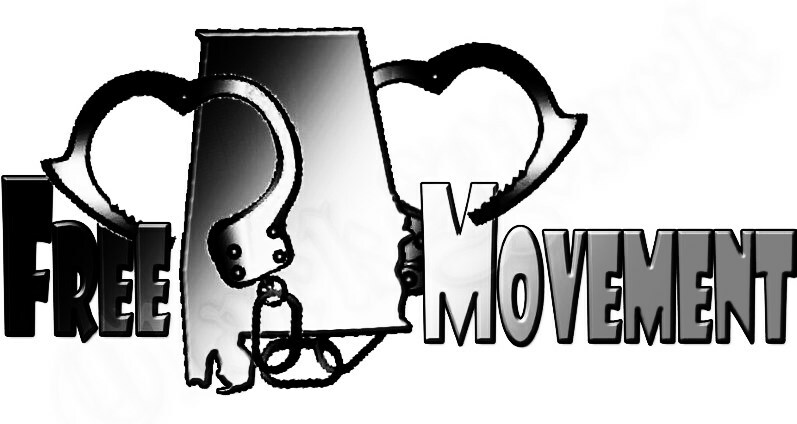 FREE ALABAMA MOVEMENT has UNITED with FREE MISSISSIPPI MOVEMENT, to form FREE ALABAMA-MISSISSIPPI MOVEMENT UNITED. 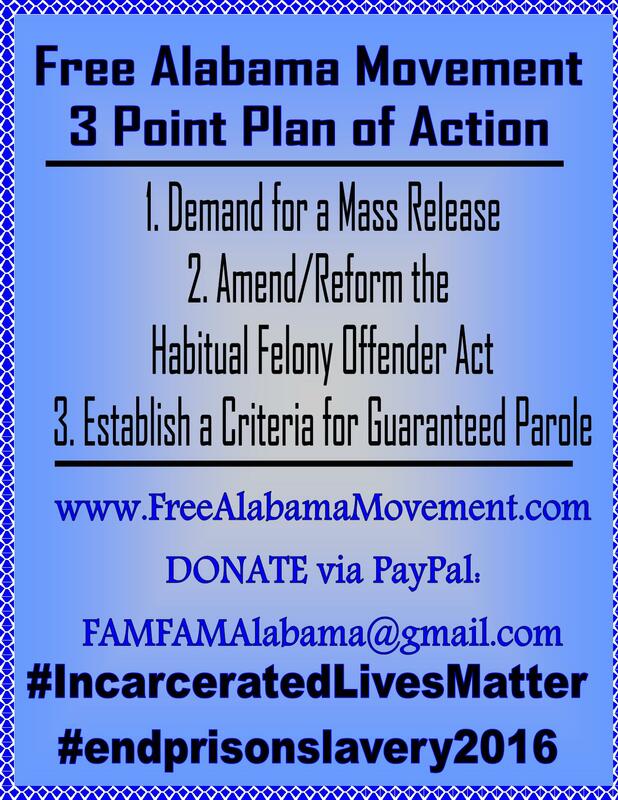 FREE ALABAMA- MISSISSIPPI MOVEMENT UNITED now represents over 53,000 men and women incarcerated (29,000 in Alabama, and 23,000 in Mississippi). Our goal is to Unite all 2.5 million men and women who are incarcerated in the U.S.
Florida, Georgia, Louisiana, Texas, California-Washington, and Illinois, but we are ready to accept anyone who is ready to organize right now, in any State. 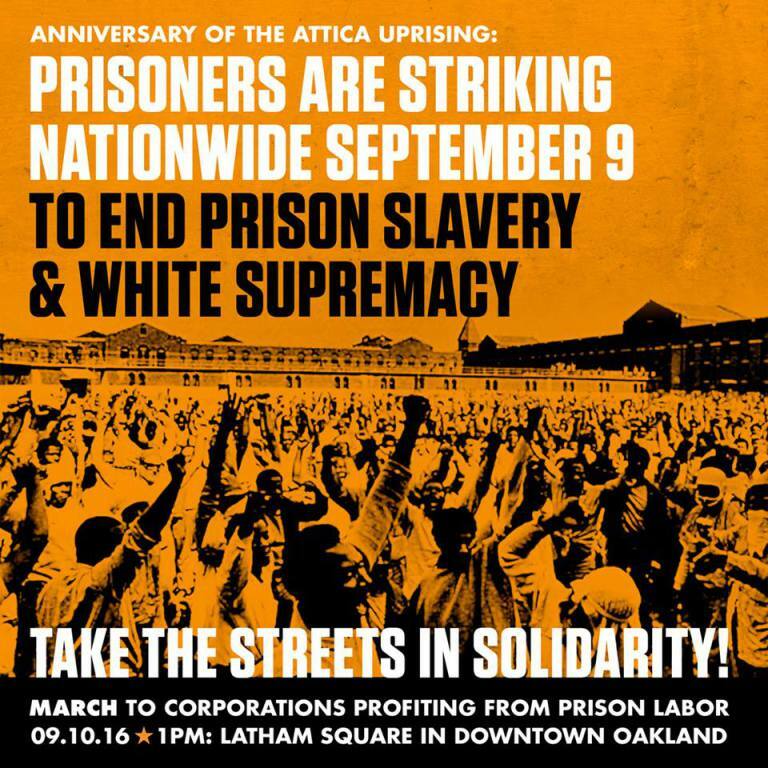 The “FREEDOM MOVEMENT”, which is THE NATIONAL MOVEMENT AGAINST MASS INCARCERATION AND PRISON SLAVERY, must be led from the inside. Instead of being a place for corrections, the ADOC has been turned into system of capitalism, where thousands of poor, uneducated, and disenfranchised citizens are being forced into labor to support a multi-billion dollar Prison Industrial Complex. 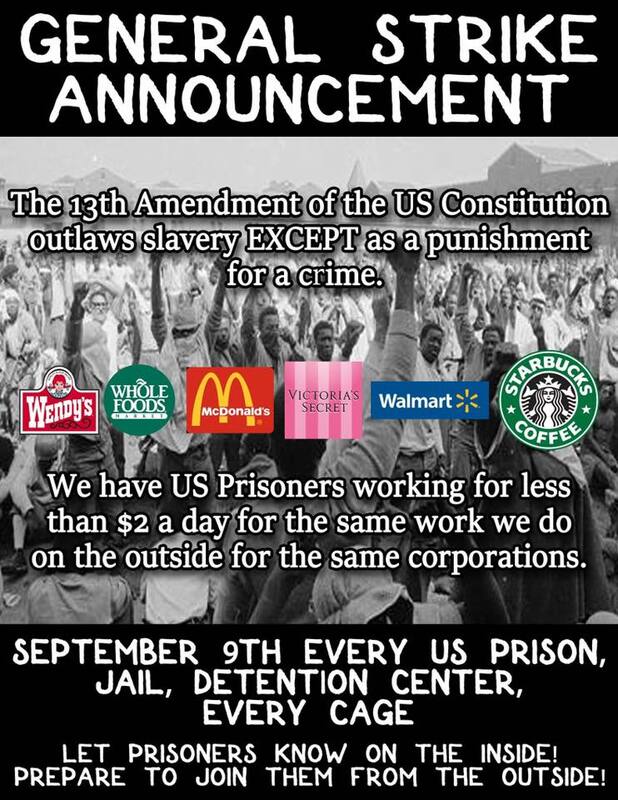 In order to fuel this billion dollar enterprise, which includes prison slave labor, expensive phone rates, court fines and fees imposed of people with no income, co-pays, copying costs and more, the ADOC currently has created the most overcrowded, underfunded, and understaffed prison system in the U.S.A., with over 30,000 humans packed into space designed to hold 13,500. These prisons have vermin infestation, roaches, diseases like HIV, TB, Hepatitis, and more. And, the people being held in these conditions are being forced to live, work and produce billions of dollars-worth of labor, fines, and costs, while having no control over when they will ever go home again. Every week, approximately 10,000 men and women laborers in ADOC are forced to work for free. (For the few that do earn a wage, they are paid from .17 to .71 per hour, for 10-12 hour days. Less than 10% of the 10,000 laborers are wage earners). Prison labor in Alabama includes food preparation, laundry, and facility maintenance, as well as the production of furniture, license plates, and chemicals, recycling, print shops, fleet service, cattle ranch, farm squads, road crews, sand mining, and more. 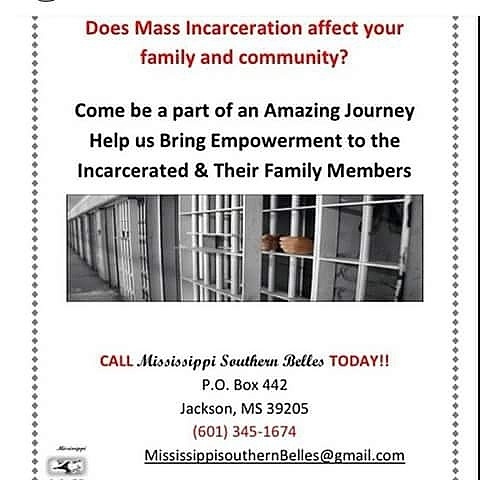 incarceration and prison slavery in Alabama and anywhere else that it exists in the U.S.A.
Join us and start a Chapter in your State today. 1. 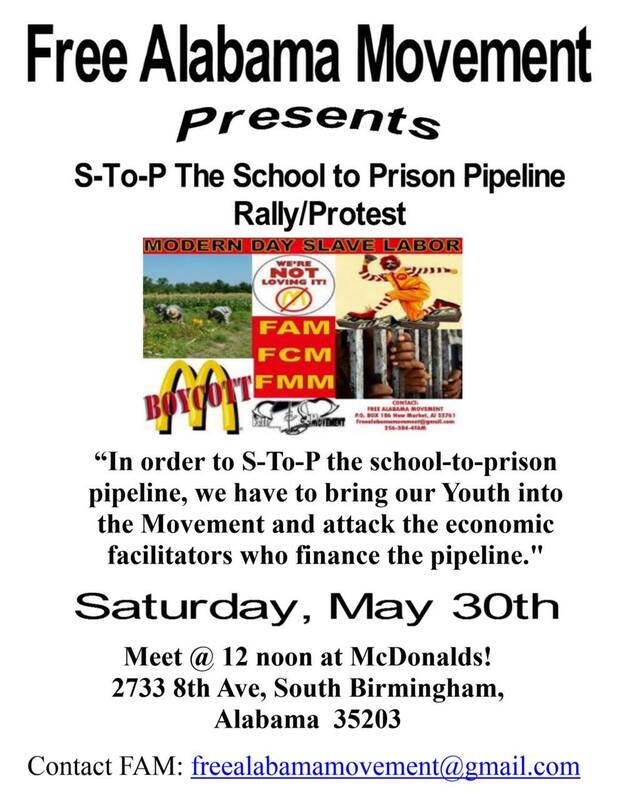 To Put An End To The System Of Free Labor Within The Alabama Department Of Corrections. 2. To put an end to the inhumane living conditions under which Alabama prisoners suffer, including overcrowding and the warehousing of large amounts of people for no purpose other than exploitation and free labor. 3. To abolish capital punishment and life without parole sentences, and to overhaul Alabama’s current parole system to provide more deserving people with an opportunity to earn their release from prison. 4. To put an end to arbitrary laws and sentencing practices that has resulted in the targeting of specific race groups and disproportionate sentences. A FULL LIST OF OUR DEMANDS FOR CHANGES THAT WE DEEM NON-NEGOTIABLE CAN BE FOUND IN OUR “FREEDOM BILL” FOR EDUCATION, REHABILITATION, AND RE-ENTRY PREPAREDNESS. 1. We want an end to the system of free labor within the Alabama Department of Corrections. 2. We want to end to the inhumane living conditions under which Alabama prisoners suffer, including overcrowding and the warehousing of large amounts of people for no purpose other than to extract free labor. 3. We want improvements in healthcare, a proper and balanced diet, and more control of our resources and the money our families send to us. We also want an end to exploitive practices that penalized our families, like J-Pay, excessive phone call rates, high canteen and incentive prices, and medical co-pay services. 4. Reform in youthful offender law so that children will no longer be sent to prison for crimes committed beginning at 14 years of age. 5. Repeal of the Capital Punishment Act, the Habitual Felony Offender Act, Alabama Prison Litigation Reform Act, and other repressive laws. University of Maryland students from Organization of Prison Abolitionists and many other groups will stand in solidarity with FAM on September 9th on our campus! Thank you as well for the amazing work that this organization has done to resist and strengthen the struggle against mass incarceration, white supremacy, and slavery. Thank you Terps. We appreciate the support and we hope to be able to work with y’all soon . Is this Wanda from Bay View?